The big day loomed cold and grey, not my favourite running weather but it beats blazing sunshine. I managed to improve on Cardiff Half Marathon last year by 4 minutes, which I'm very proud of. I'm in the middle below - number 13677. I had a whole support crew at this race and it made all the difference in my opinion, DH followed me around the double loop circuit and was a one man fog horn cheering me on - my children, in-laws and a bunch of family friends also braved the bitter cold winds to watch out for me. 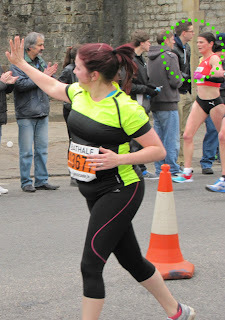 I found the race incredibly tough due to the cold and frequently wondered what I was doing slogging up the bath course inclines (don't get me wrong they weren't bad but add the cold and I just wasn't feeling it). Well it's done now - I'm looking forward to the next half marathon even closer to home this time in Tewkesbury and 15 training weeks away!